Marysia (Mollye) Goldman founded the Mollye International Doll Company in 1929 (have also seen the company name as: Molly'es Doll Outfitters, Inc., Mollye Creations). Early dolls are made of cloth, originally they used neighborhood women who sewed from their homes to make the dolls, later they opened a factory that employed as many as 500 people. Mollye also designed costumes for other doll companies; Cameo, Effanbee, Horsman and Ideal (Shirley Temple doll clothes). Mollye purchased quality composition, hard plastic and vinyl dolls from various manufactures and then dressed them in original clothing and sold them under her own name, Mollye Dolls. Thus, many of the composition and hard plastic dolls are unmarked but had a hangtag, later vinyl dolls are marked on the head: Mollye. From 1935-1938 Molly'es Doll Outfitters, Inc., produced the Raggedy Ann and Raggedy Andy cloth dolls (several conflicting stories about this, bottom line is they were sued in 1938 to stop producing them by Johnny Gruelle), in 1937 Mollye's created the Hollywood Cinema Fashion Doll series of stars and famous persons, they also made a group of composition dolls in the 1940s based on the Thief of Bagdad movie and are considered some of this companies finest work. Mollyes Character Dolls, 15, 18 or 24" tall, stuffed cloth body, yarn hair, mask type face, with big round, side glancing painted eyes and mouth, dressed, doll is unmarked doll with a hangtag. 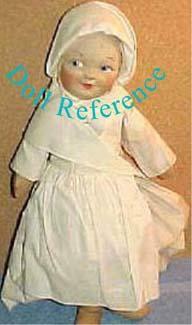 Mollyes Nurse doll, all cloth doll, mask type face, 15" tall, has a Mollye cloth label sewn on dolls leg. 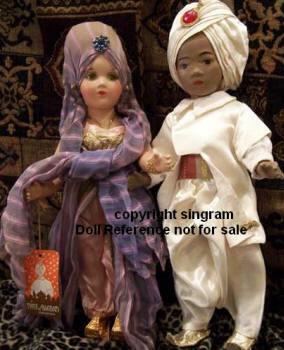 1940s Mollyes Thief of Bagdad Movie Dolls; The Thief (Sabu) 15" tall, all composition, Sultan (Miles Malleson) 19" tall all composition, Princess (June DuPrez) 14" tall all composition or 18" tall cloth doll, Maid in Waiting, 14" tall, all composition, Prince Ahmad (John Justin) 23" tall, cloth doll. 1940s Mollyes Maid in Waiting doll 14" tall and Sabu doll 15" tall, all composition dolls with jointed bodies, sleep eyes (Maid), painted eyes (Sabu), she is wigged, dressed in her original outfit with hangtag as is Sabu. 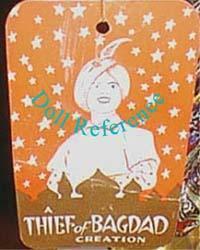 Dolls are unmarked, with a hangtag to identify them. 1950s Mollyes Lone Ranger doll, 28" tall, companion to Tonto, hard plastic head, sleep eyes, real upper lashes, painted lower lashes, molded lightly painted hair, open mouth with two upper teeth, magic skin latex stuffed body, dressed in light blue long sleeve shirt with gold braid, matching neck scarf imprinted with: The Lone Ranger (picture of him with his horse Silver), Hi-Ho Silver © TRL, Inc., brown pants, vinyl belt with gun in holster, brown vinyl boots, black face mask, brown felt cowboy hat. Doll is marked 28 or unmarked. Hangtag and box read: Created my Mollye. The box was originally imprinted with "Cowboy Joe" which was scratched thru and then imprinted with The Lone Ranger. There are also girl dolls called Rangerettes. 1950s Lone Ranger doll, 28"
1950s Mollyes Tonto doll, 28" tall, Lone Ranger's companion, hard plastic head, sleep eyes, real upper lashes, painted lower lashes, molded lightly painted hair, open mouth, magic skin latex stuffed body, dressed in light brown suede like cloth two piece shirt & pants, applied vinyl fringe and two appliqué' faces with Tonto's name on upper shirt front, vinyl belt, and headband, also imprinted with Tonto's name. Doll is unmarked. 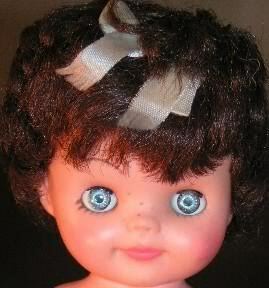 1960s Mollyes Perky doll, 8" tall, vinyl head (Effanbee's Fluffy doll mold), jointed plastic body, rooted short hair, sleep eyes, freckles sprinkled across her nose, closed mouth, doll is unmarked. Effanbee appears to be the originator of the Fluffy doll mold and their doll is marked Effanbee, other doll makers who sold Fluffy doll molds include; Allied Grand a doll called Bonnie who is marked AE, Mary Hoyer named and sold this doll as Margie (no freckles), Kellogg's doll is named Linda Lou, used as a mail in premium Advertising doll, is unmarked and Valentine used this doll mold for the 13-15" tall, Perfect Patient doll who is unmarked, are some of the doll makers that we have found. Mollyes International Children's Doll series, 13, 15, or 27" tall, stuffed cloth body, mohair wig, with mask type painted face, wears a regional costume, unmarked doll with a hangtag. 1935-1938 Mollyes Raggedy Ann or Raggedy Andy dolls, 17-22" tall, stuffed cloth bodies allow doll to sit, legs are multi-colored striped material, dark auburn yarn hair, painted face with large black eyes and triangle nose outlined in black, was the first to print a heart on the dolls chest. 1935-1938 Mollyes Baby Ann or Baby Andy dolls, 14" tall, stuffed cloth body, usually stamped on the chest; Raggedy Ann and Andy Dolls, manufactured by Mollye Doll Outfitters. Mollyes Baby, Girls or Toddler dolls, 14, 15, 18 and 21" tall, all composition. Mollyes Teenage or Lady dolls, 15, 18, 21 or 27" tall, all composition. 1937 Mollyes Hollywood Cinema Fashion Dolls; June Allison, Joan Crawford, Olivia DeHaviland, Irene Dunne, Douglas Fairbanks Sr., Betty Grable, Jeannette McDonald, Queen Elizabeth and Princess Margaret Rose, all composition jointed dolls. Mollyes Teenage or Lady dolls, 14, 17, 23, or 27' tall, all hard plastic, wigged, sleep eyes, closed mouth, jointed at neck, shoulders and hip, unmarked doll with a hangtag. 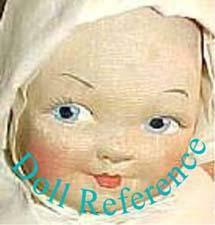 Mollyes Baby doll or Child dolls, 9, 12, or 16" tall, all vinyl, sleep eyes, closed mouth, jointed at neck, shoulders and hip, marked: Mollye. Mollyes Darling Little Women, 8 or 12" tall, all vinyl dolls.